A new virus has been spreading throughout the ranks of the internet through various means: malicious emails, infected webpages, and infected file downloads. The damage can be quite extensive as you can lose access to every file on your hard drive unless you pay up to about $300 for the encryption key. CryptoLocker is a virus is typically distributed as an email attachment or through a deceptive link in an email or web site. This type of virus is classified as “Ransomware” as it holds your files hostage until payment has been made and you are given the code to get your files back. Once CryptoLocker is running on your computer, it scans the data on your local hard drive, external drives (including USB flash drives), and networked (shared) drives. 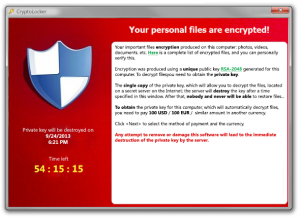 CryptoLocker then encrypts these files resulting in many programs displaying error messages that your files are corrupt. Once all the files are encrypted, the screen below is displayed and the countdown timer begins. Once the timer runs out, your files will be practically irrecoverable. If you see the popup window requesting payment, indicating that you have been infected, your files are already encrypted. This means you have two options: Either pay to receive your unique code or lose access to all files on your hard drive, shared drives, and external hard drives connected to your computer. NEVER open an email or attachment from someone that you do not know or trust. BACK UP YOUR DATA! Back up your data at least once a day. If you happen to be a victim of the cryptolocker virus, your backup drive will be safe as long as it is not connected to your computer. If you believe you are infected with any virus, please contact the ITS Helpdesk (773) 508-4487.